To catch trout on freestone streams, you have to understand the different types of rivers, the influences of the seasons, and the effects of weather. FREESTONE STREAMS ARE INTRICATE WATERWAYS; no two are the same. There are many similarities in the origins of freestone streams and how they develop as they reach their final destinations in a lake or ocean. But, due to development, dams, or other man-made blockages, many freestone streams have been altered. Fortunately for fly fishermen, the majority of streams have sections that remain intact, natural ecosystems where their flows are uninterrupted by human influence. The only barriers on these stretches are natural obstacles, such as beaver dams or debris. HOOK: Curved-shank scud hook, sizes 16 to 8. WEIGHT: Medium flat lead wire. RIB: Fine monofi lament thread. The trout living in the headwaters of freestone streams are usually aggressive and are therefore pretty easy to catch. Let me explain. Headwater streams have steep gradients, and any food that is deposited in the water is eaten by the lower biomass of insects or is transported as sediment farther downstream and deposited as food dow in lower-gradient sections. Due to that transportation of nutrients, less food is available in headwater streams and the fish become very opportunistic and, therefore, easier to catch. In these upper reaches of streams, there is not the diversity of insects and other food items that you will find in the lower reaches of the river. This might be why attractor patterns featuring fl ashy colors, and very generic nonspecific flies, work well on headwater trout. As we work our way downstream, the biomass and variety of insects increase dramatically. This is mainly due to the fact that the food deposited in the headwaters finally settles in the slower-flowing sections of the stream. The leaves and plant matter break down to become food for the macro-invertebrate populations. If you turn over rocks in the upper stretches of a stream, you might find few or no insects; farther downstream, where the size of the river has grown to third or fourth order, the vast majority of rocks and instream structures will have a greater number and diversity of insects: caddisflies, mayflies, stoneflies, or other macro-invertebrates. HOOK: Short-shank nymph hook, sizes 16 to 2. HEAD: Silver tungsten bead, size to match the hook. THREAD: Olive 8/0 (70 denier). TAIL: Coq de Leon fi bers. THORAX: Dark gray Spiky Squirrel Dubbing. HOT SPOT: Datum Glo-Brite #5 or a substitute. Certain species of insects gravitate toward certain sections of a stream. You will often find high concentrations of uncased caddisflies and stoneflies in heavier pocket water and higher gradient sections. There will be more mayflies in the lower-gradient, gentle riffled sections of the stream. Look for an abundance of cased caddis larvae in the margins of the stream where the current is slower and they can filter the sediment for nutrients. When fishing larger sections of a stream, select a fly to match the water. Large sections of the stream containing pocket water will have more oxygen than slow sections, and you will likely find high populations of caddisfly and stonefly larvae; fishing matching imitations is a key to success. Where heavy pocket water turns into riffles and runs due to changes in gradient and water velocity, you might have better luck using mayfly nymphs as well as cased caddis larvae. It is critical to be conscious of the varying types of water when you are fishing these lower stream courses; base your initial pattern selection to match the water. Keep in mind that all freestone streams vary to some degree. 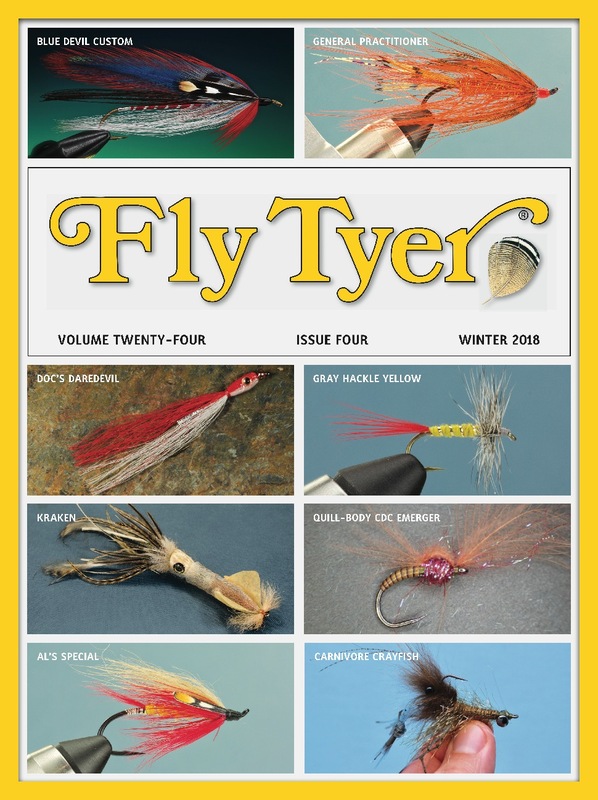 Use these generalizations as guidelines for selecting flies and fishing techniques. The accompanying 18 patterns are a great start to fishing for freestone trout. The best part about angling on freestone streams is that just when you think you have it all figured out, it rains or the seasons change, and you will have to start all over. Aaron Jasper is a regular contributor to our magazine, as well as our sister publication, American Angler. Aaron lives in New Jersey. To learn more about his flies, guide services, DVDs, and more, go to his website, www.troutpredator.com. HOOK: Scud hook, sizes 14 to 8. BACK: Czech speck Thin Skin. Loon Hard Head on top of spot. UNDER RIB: Narrow gold holographic tinsel. Loon Hard Head on top of fly. HOOK: 3X-long nymph hook, sizes 14 to 10. HEAD: 1/8-inch copper tungsten bead. THREAD: UTC 140, wood duck. TAILS, LEGS, AND ANTENNAE: Medium brown Centipede Legs. WING CASE: Yellow mottled Thin Skin. THORAX: Mike Mercer’s Buggy Nymph Dubbing, golden stone. HOOK: 3X-long nymph hook, sizes 14 to 12. HEAD: Tungsten bead, size to match the hook. TAILS, LEGS, AND ANTENNAE: Brown orange flake Crazy Legs. BODY: Mike Mercer’s Buggy Nymph Dubbing, golden stone. BACK OF ABDOMEN AND WING CASE: Yellow mottled Thin Skin. HOOK: Standard nymph hook, sizes12 to8. HEAD: Tungsten bead in black. THREAD: Dark brown 8/0 (70 denier). TAILS: Three strands of brown embroidery floss coated with superglue. BACK STRIPE:White Big Fly Thread. BODY: Brown Spiky Squirrel and bronze Ice Dubbing blended together. HOOK: Standard nymph hook, sizes 16-10. THORAX: Insect green Ice Dubbing. HOOK: 3X-long nymph hook, sizes 10 to 6. HEAD: Black, size to match the hook. ABDOMEN: Brown SLF Spiky Squirrel Dubbing. HOOK: Standard nymph hook, sizes 18 to 14. HEAD: Tungsten bead, color of your choice and size to match the hook. THORAX: Dark brown Spiky Squirrel Dubbing. WING CASE: Holographic Mylar tinsel. HOT SPOT: Datum Glo-Brite #7 or a substitute. WING CASE: Black Scud Back. HOOK: Standard nymph hook, sizes 14 to 6. HEAD: Copper or brown tungsten bead. TAILS: Medium pardo coq de Leon fibers. HACKLE #1: Brown cul de canard. HACKLE #2: Brown hen hackle. HOOK: Short-shank nymph hook, sizes 16-2. HEAD: Tungsten copper bead, size to match the hook. ABDOMEN: Brown turkey biot. RIB: Small copper wire. THORAX: Brown Spiky Squirrel Dubbing blended with brown Ice Dubbing. HOT SPOT: Datum Glo Datum Glo Brite – # 7 or a # 7 or a substitute substitute. HOOK: Tiemco Competition TMC550bl, sizes 16 to 10. HEAD: Black tungsten bead, size to match the hook. HACKLE: Brown hen neck hackle. HOOK: Curved-shank scud hook; 24-18. HEAD: Black or copper bead. THORAX: Black 8/0 (70 denier) thread. WING CASE: Small pearl Mylar tinsel. HOOK: Regular nymph hook, sizes 22 to 16.